New York City Mayor Bill de Blasio (D.) said Sunday that Amazon's decision to rescind its plan to open a second headquarters in the city is proof there is plenty of money in this country but it's in the wrong hands. 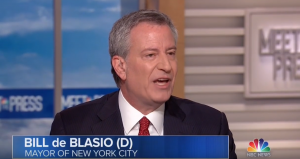 "I say there is plenty of money in this world and plenty of money in this country, but it's in the wrong hands, and Amazon is making my point for me," de Blasio said on NBC's "Meet the Press." Amazon announced that it would cancel its plans to open a second headquarters in New York City after local politicians criticized the deal that allowed Amazon to receive $3 billion in tax breaks. "A number of state and local politicians have made it clear that they oppose our presence and will not work with us to build the type of relationships that are required to go forward with the project we and many others envisioned in Long Island City," Amazon said in a statement. Democratic socialist Rep. Alexandria Ocasio-Cortez (D.) led the charge against Amazon and said the company was taking advantage of working class people. She accused the company of not showing "good faith" to the people of New York City. When Amazon announced that it was pulling out from the deal, Ocasio-Cortez celebrated the decision. De Blasio doesn't put the blame on Ocasio-Cortez or local politicians who opposed the deal; instead he blamed it on Amazon. "Let's be clear. No one chased away. This was Amazon's arbitrary decision. We had an agreement. If I made an agreement with you, and there were issues that came up but we had an agreement, you wouldn't call me in the dead of night and say, ‘We're taking our marbles and going home,'" de Blasio said. According to de Blasio, this is proof that the money in the country is in the wrong hands. De Blasio is one of the most far-left politicians in the country and no stranger to advocating a redistributionist worldview. Earlier this year, he said the same thing when he was selling universal health care. However, his comments on "Meet the Press" run counter to what he reportedly said about Ocasio-Cortez and other progressives making "mistakes" by pushing businesses away. When host Chuck Todd asked de Blasio if this message will be part of his potential presidential campaign, the mayor said he's not sure. "I have not ruled it out, but I'm going to take this message nationally anyway you slice it," de Blasio said, "because this is an urgent moment. There is an inequality in this country right now that is threatening to tear us apart."